What various temperatures, then, the fishes of this pond can enjoy! They require no other refrigeration than their deeps afford. They can in a few minutes sink to winter or rise to summer. How much this varied temperature must have to do with the distribution of the fishes in it. The few trout must oftenest go down below in summer. On August 23 of this year I repeated Thoreau’s measurement. My son Jasper, our friend Ariel, and I paddled a canoe out to the deepest spot in the middle of Walden, using Thoreau’s 1846 map as a guide. The air temperature in the Boston metropolitan area has risen by about 4 to 5 degrees since Thoreau’s time, and the ice on Walden is now melting two weeks earlier in the early spring. Would the temperature on the bottom of Walden still be 53 degrees, or is it now warmer due to climate change? At the middle of Walden, we lowered three bottles into the water on a weighted line: a hot one at 109 degrees, a cold one at 55 degrees, and one filled with lake water at 78 degrees. Would they all be the same temperature after 30 minutes on the bottom? The weighted line took the bottles down to a depth of exactly 100 feet. 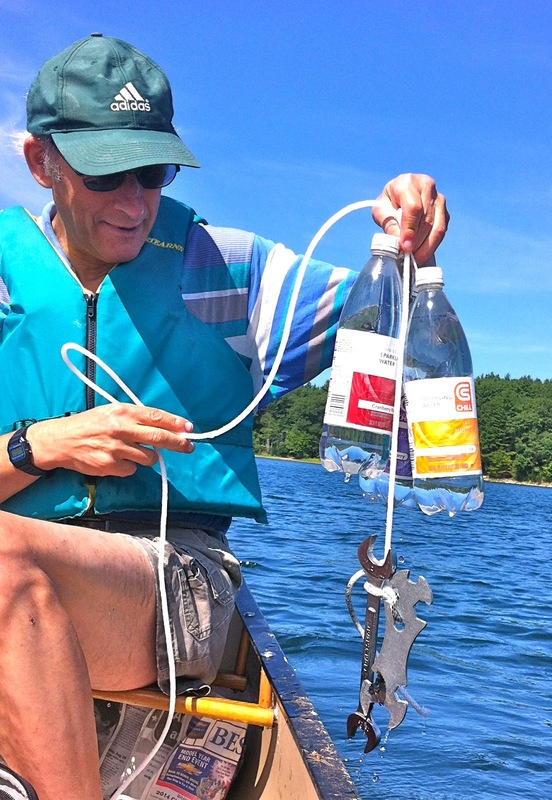 Lowering bottles into Walden Pond on a weighted line. Photo by Ariel Chua. After 30 minutes, we hauled up the bottles. The lake water bottle and the cold water bottle each measured 50 degrees, a bit colder than Thoreau’s measurement of 53 degrees. The hot water bottle measured 52 degrees; was it hotter because it started hotter? A re-measurement of the lake water bottle showed 54 degrees; it had gained 4 degrees in 4 minutes from the surrounding 76-degree air. In our case, we were using a fast electronic thermometer that took only seconds for a reading, whereas Thoreau was using a slow mercury thermometer that would have taken several minutes. So our first slightly colder temperature reading was probably just due to our ability to measure the temperature more quickly than Thoreau had before the water had warmed up by a few degrees. After 153 years, the bottom of Walden Pond is still a cold place for fishes, and has changed little since the time of Thoreau. The great depth of Walden Pond has apparently insulated the bottom from the changes above, at least for now.